Some forms of words are so completely familiar that we never notice the work they do. In this guest blog, Ann Weatherall and Leelo Keevallik make us look afresh at the formulation I [mental appreciation] that you X, where X is some state of mind – so things like I know that you’re angry, or I thought that you’d like that and so on. Are they as innocent as they seem? Their article is in the latest issue, but to see how they got there, read on…. This paper had a long and sometimes fraught gestation. In this blog we describe how the research began, the difficulties we encountered in defining/refining our target phenomenon and the challenges of establishing the interactional matter it was mobilised to address. The research process has been a roller coaster ride of highs from the thrill of discovery to the lows of (at first!) failing to convince reviewers. It is very satisfying to have the end result finally published. Of course, the outcome is not only the product of our own substantial work but also from the generous input of many others during data sessions and conference presentations. We really appreciate being part of a scholarly community of like-minded researchers including ROLSI reviewers and of course its editor. The work for this paper began happily enough some three years ago. In the first instance it was motivated by a curiosity about how bringing together our different disciplinary backgrounds in discursive psychology (Ann) and interactional linguistics (Leelo) would work. A complex psychological and grammatical expression that piqued our joint interest was when speakers made some kind of first person cognitive claim about the ‘internal’ processes (e.g., beliefs, desires, feelings, intentions, understandings) of another (e.g. I knew that’s what you want). Ann had a couple of cases in her New Zealand data and Leelo immediately recognised some instances in her Estonian and Swedish recordings. We initially called our target ‘claims to the intersubjective’. Building a collection may appear as a relatively straightforward starting point for research. However, when working with claims to the intersubjective we kept re-shaping our collection to the very end. At first, we cast our net really broadly to include all cognitive statements in the first person (e.g., I know, I guess, I thought, I don’t believe) followed by a statement about the mental state of another (e.g., Tom Slone wants, you’re trying, you hate it). Working through all the cases one by one left us feeling utterly bewildered at the huge variety of forms. positions and functions of the target expression. We began to develop more stringent criteria. Early on we decided to exclude cases that referred to a third, non-present party, were in the past tense and/or negatively formulated. Also weeded out were instances of ‘I think’ and ‘you mean’ – lexicalized formats that have been neatly analysed by several other researchers as stance markers and repair initiations. The first version of our manuscript included cases with a variety of I + COGNITIVE VERB + YOU + PSYCHOLOGICAL FORMULATION, across different institutional and mundane contexts in all three languages. The instances were more or less clearly responsive – an impreciseness the reviewers critiqued. We were certain we had found a consistent pattern where the expressions were attentive to self-other relations and progressed the speaker’s action agenda. However, the reviewers not only questioned some of our analyses but were also unpersuaded that such diverse and complex linguistic forms could have a unitary effect across interactional environments. It was rejected, albeit with encouraging overtones. Finally, we decided to refine the focus to claims to ‘understand’ some aspect of the other’s mind. Even then we could be exhilarated one day over having found so many, and desperate the next when we felt they were all still too diverse: from a variety of sequential positions, settings and in several languages. We eventually crafted a brand new paper, albeit one where the general actions of our targets remained the same. This time we got a revise and resubmit with clear suggestions for the changes that needed to be made. These things keep cropping up! We could only have wished for more instances like this in our data! As anecdotal evidence, it may have saved our collection. At least it gave us the confidence that we had indeed documented a general practice that held across a variety of settings. Weatherall, A and Keevallik, L (2016) When claims of understanding are less than affiliative. 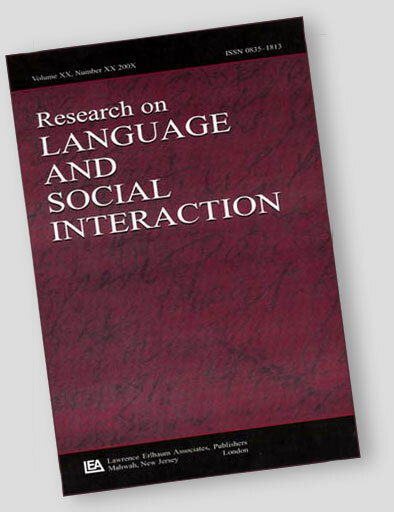 Research on Language and Scial Interaction, 49 (3), in press.